A patch, also known as a cloth badge, is an embroidered piece of cloth which can be attached with a pin or sewn on to fabric. There are also more modern methods which include iron-on, adhesive, or Velcro. The introduction of the computerized machines has turned a once rare art into mass-production. Embroidered patches were invented thousands of years ago as an important identification tool for military and other uniformed personnel. Today they are used by government organizations, sports teams, and companies to denote rank, position, or specialized unit. Military patches are full of metaphor, from the colors to the images portrayed. For example, white means peace, gold means generosity, blue and green mean loyalty. Animals such as lions, tigers, and elephants usually represent courage. For hundreds of years, embroidered patches were worn only for practical reasons such as covering up holes and labeling people in uniforms. But, that all changed several decades ago. In the early ‘60s, young people came out on the streets to protest the Vietnam War. After that, in the mid-‘60s, a new counter culture appeared, protesting with their peace signs, flower head bands, and patches. They were idealists, embracing love and empathy. Although unintentionally, their movement affected trends across the world. The hippie movement was no longer all about morals, but about fashion as well. Hippies were getting military, second-hand clothes and started embellishing them with cloth patches. The patches showed off the icons of the movement and were printed or embellished, satirical and radical. In the ‘80s, though they had a new look, patches signified the same things – a badge of identity and solidarity. In the late ‘70s and early ‘80s, the counter culture morphed into the punk movement. People had had enough of fighting the problems with peace and love and instead took on some more drastic measures – like spikes and chains. The spirit of anarchy spread across to Great Britain and Europe, and designers such as Viviane Westwood and Jean Paul Gautier popularized what was called the “anti-fashion”. 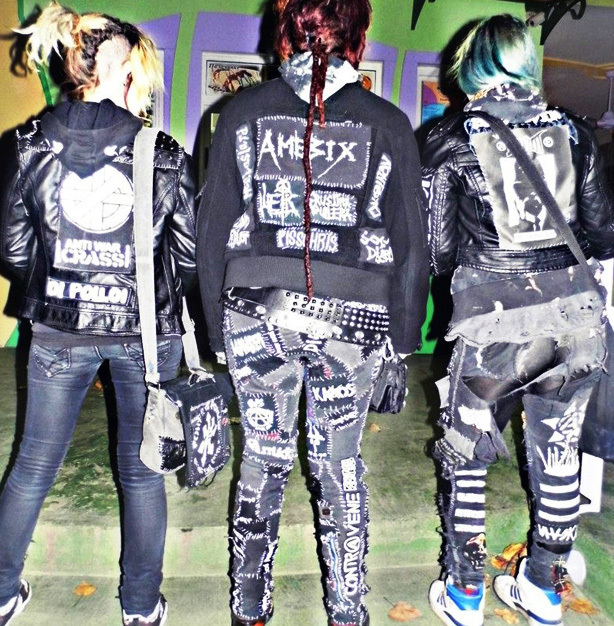 Punks were wearing patches with their favorite bands across the shoulders or on the back of a customized blazer, denim vest or a leather jacket. Clothes were making a louder statement! 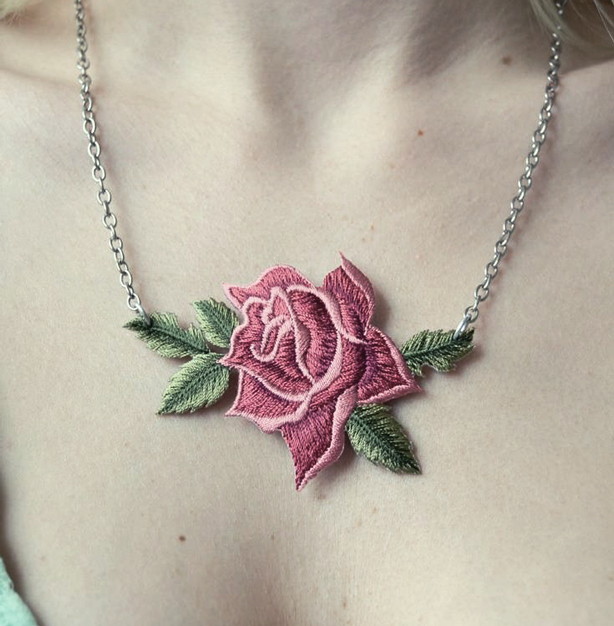 They often used cheap materials such as dental floss to sew them on, or stitched them on with safety pins. Patches were often carrying a political message. Also in the ‘80s heavy metal became popular. The key elements of metalhead fashion remained unchanged – black clothes, long hair, and leather jackets, usually covered with denim vests with patches, band tees and spiked wristbands. The headbangers’ clothing has its roots in biker and rocker subcultures. As with other musical subcultures, the emblems and logos announced the interests of the wearer. Ever since, the patches are always being revived and adapted. Have a look at the latest Marc Jacobs or Gucci collections. Their idea is that identity and inspiration should be found on the streets. And in the streets, patches continue to be the indicator of social and political climates, but also of personal style and identity. Modern patches are usually iron-on, which means they have some adhesive on the back, so even if you’re not a crafty DIY enthusiast (like most of us aren’t) there really is no excuse not to try this trend, and make each item of your clothing truly your own. Of course, with modern trends you can always buy an item with the patches already embroidered on (which requires no thinking), but where’s the fun and creativity in that? Everyone’s probably been dreaming of having at least one truly customized item, and not having to worry about someone wearing the same clothes as them! As you’re about to see, they can be attached to pretty much anything; such as jeans, jackets, T-shirts, sweats, sneakers, bags and even phone cases. They can make you look anything from stylish and elegant to rebellious and bold! We can’t talk about patches without showing you how it all began. 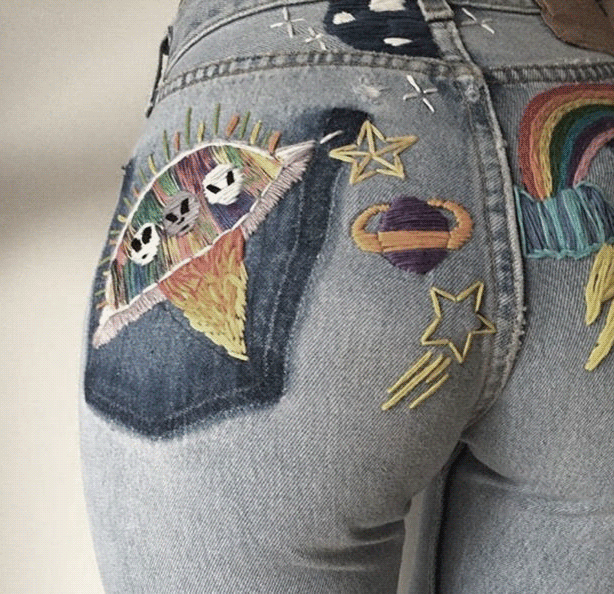 For an authentic hippy look, you can apply patches both to your denim jacket and your jeans, just keep it sweet, you know – sunshine, lollipops, and rainbows, that sort of things. 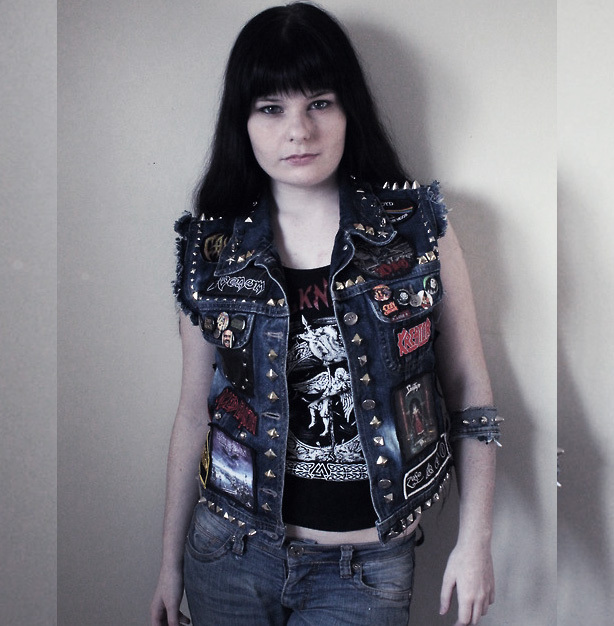 For a classic, 80s metalhead look, add a bunch of patches and studs to a denim vest and wear it over a band tee, preferably white, and a denim skirt or jeans. Add a bullet belt and a dog tag necklace to finish off the outfit. For a modern take on the punk look; wear patched black skinnies with a studded vest, leopard creepers, and a contrasting unnatural hair color. Finish with a black bandana and a leather wrap bracelet. The easiest way to start incorporating the patches trend into your wardrobe is – take an old tee, find a motif you like, and apply it. 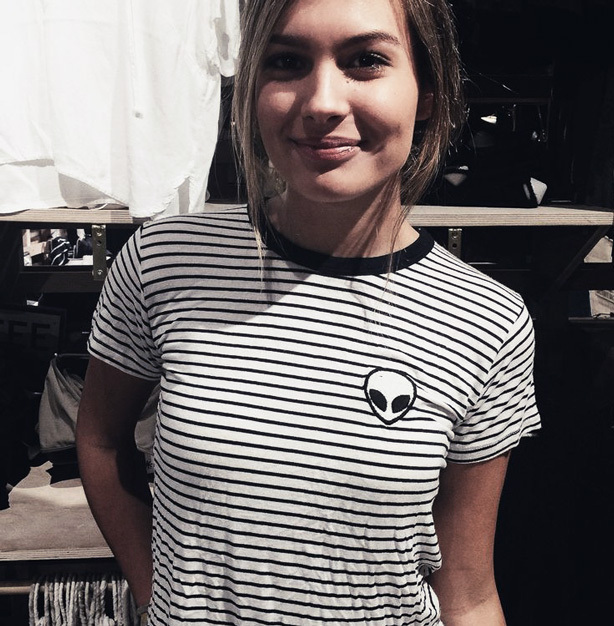 Where there’s one, there will be more (in this case, aliens). Pair it with a tattoo choker and jeans for a grunge look. 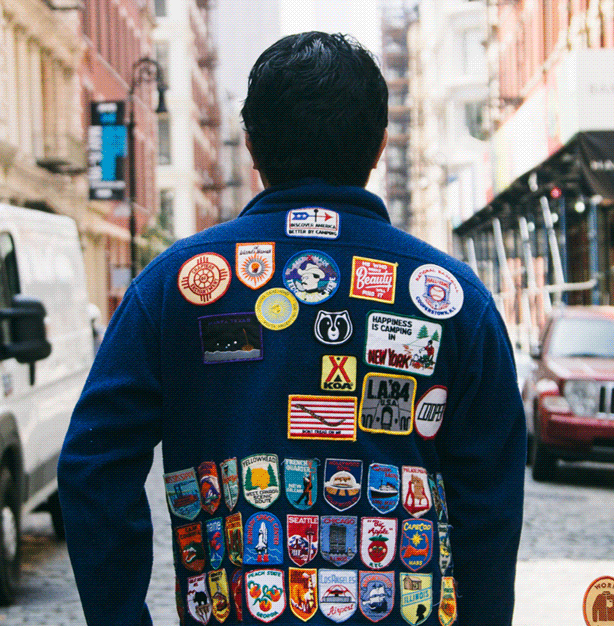 Place your patches where they’re meant to be– on a military jacket. As if military jackets weren’t already the most badass item of clothing in history, now you get the chance to embellish them with all sorts of things. Take a single patch and place it on your sleeve. You can even glam it up with some jewels and pins. Add an interesting necklace and you’re set! Or, you can add multiple patches to a military jacket, but keep the rest of the outfit all black. Try a black shirt, skinny jeans, chunky boots, chain cross-body bag, and a cool pair of shades. Place a bunch of pins and patches on one side of a simple navy blazer and you’re sure to be a hero in every fashion story. This kind of jacket truly makes the outfit. For this awesome sporty chic look, add the patches to a long black coat but pair it with a casual black and white varsity dress. Finish the look with a baseball cap and a bandana. 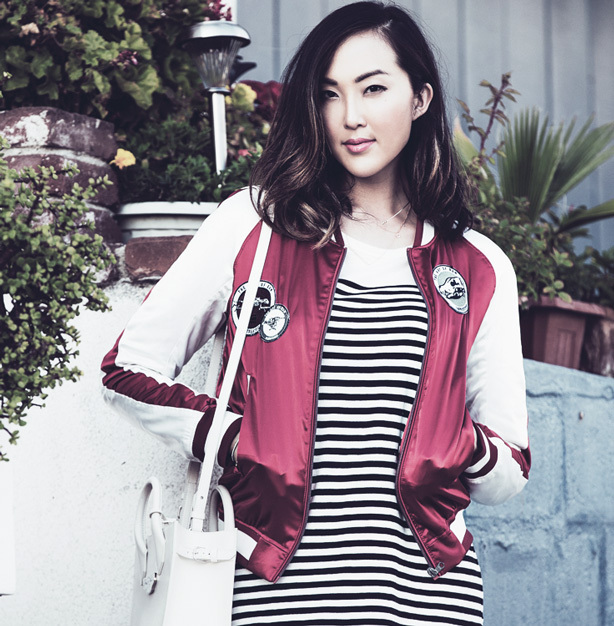 Pair a retro track jacket trend with the patches trend and you can’t go wrong. Place a couple of patches to a contrasting red jacket, and keep the rest of the outfit interesting but simple. 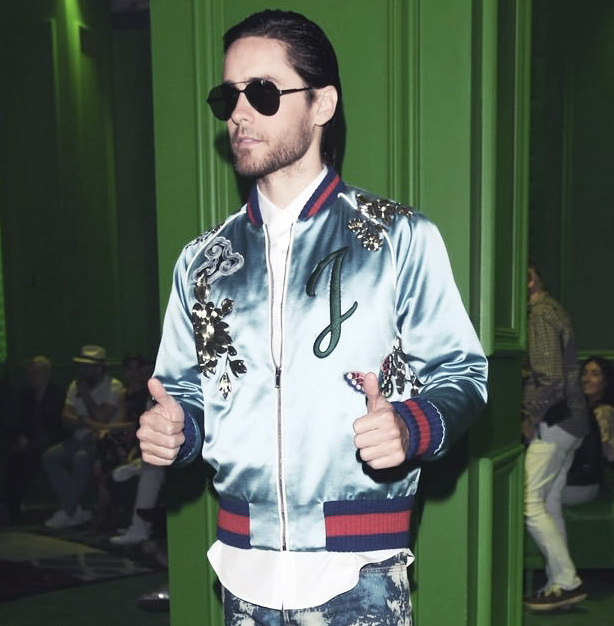 You’ve probably been seeing Jared Leto on his social media in a track jacket and wondered what he’s wearing. Well, it’s the new Gucci jacket with patches and his initials. For a Gucci look, wear a bright colored jacket with some tropical motifs. Aviator glasses obligatory. 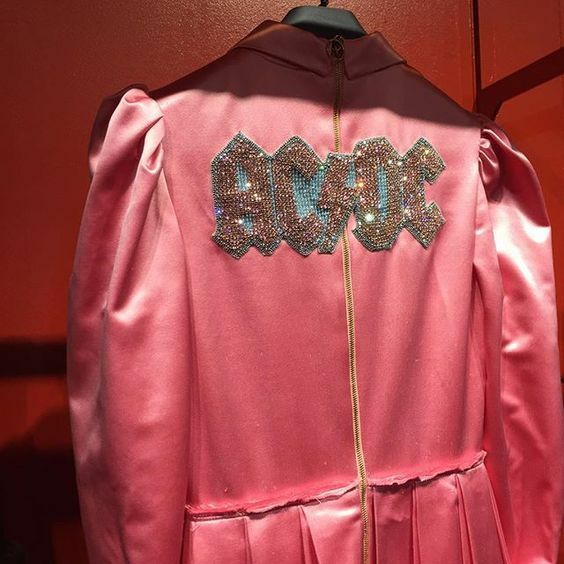 Fun fact: Gucci is also planning a Gucci and AC/DC collab! How fabulous is this jacket?! Just add rhinestones to your band patch and place it on a funky satin jacket, for a totally glam metal look! One of the more common ways to wear patches. In this picture, the pants may look a bit busy, but see how well they work with a graphic band tee. Add a funky studded bag, a leather jacket, and a matching scarf for a put-together look. OR, you can apply just a few patches on each leg. Pair your customized jean with a simple black tee, a funky blazer, a chain necklace and some fabulous lace-up sandals for a more elegant look. 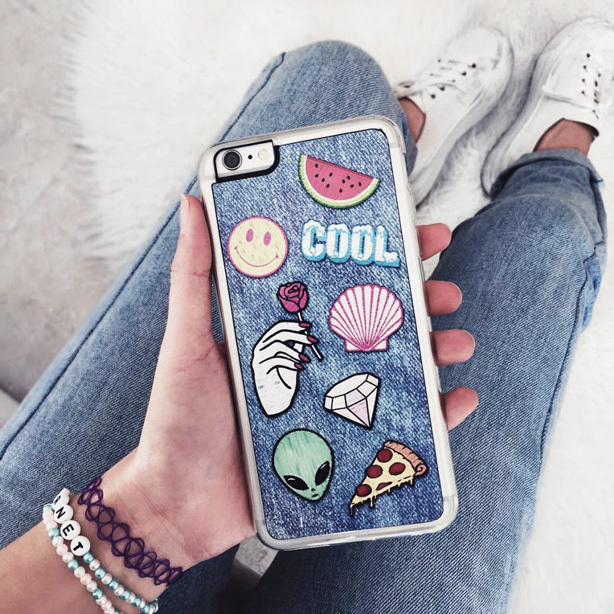 You can even match your phone case with your jeans now, how cute! To compliment your grunge influenced phone, add a tattoo bracelet and some white sneaks! Be an instant rock star with a couple of star patches on the sleeves of your black leather jacket. Pair it with a lace top and black pants for a delicate yet tough outfit. On the other hand, you can go all out with covering your leather with patches and studs all over the sleeves. Pair it with – again - a band shirt, and some white pants. You can even add interest to your plain white Chucks with these cute but effective patches. Wear these to spice up a simple jeans and a white tee outfit. 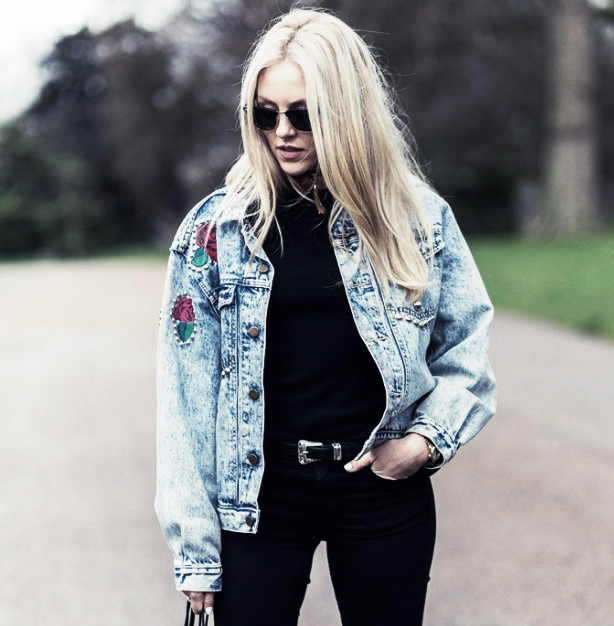 Take a darker denim jacket to make the patches stand out more. Pair them with a delicate lingerie top and crochet shorts for a boho look. Add a few layered necklaces and cowboy booties. Or take a simple denim jacket coupled with a leather skirt and colorful floral Dr. Martens for a modern grunge look. Add a white purse to compliment your top. Tweed-style blazers, like the one blogger Annabelle Fleur is wearing, make everything look sophisticated and polished, even patches and Adidas sneaks! Wear them with an all-black outfit and add a matching bag. For a fall look, wear a cute summer dress with a turtleneck, black tights, patent heels, and of course a matching blazer with a couple of patches! 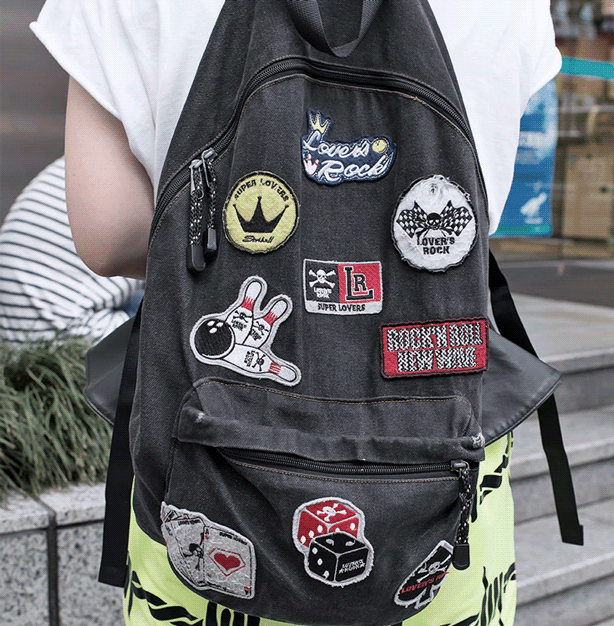 ‘90s style backpacks are back! Wear them with a long flannel shirt around the waist, a baseball cap, matching colorful nails, and a carefree spirit. Denim skirts are also making a comeback! They can look totally cute with a plain red or white tee and a chain bracelet but custom patches will make the look all your own. Throw a black leather jacket over your shoulder for style with an attitude. Pierce a hole in your colorful patches and put them on a gold chain. There’s no easier way to make a fully customized, cheap statement necklace! If you don’t like bright colors, do the same with a silver chain and some black patches. A denim vest or shirt can look totally modern paired with funky colored patches over a matching dress. Stack up some bracelets for an even more interesting outfit! How elegant and lady-like does this customized leather handbag look with this glamorous silver dress? Add studded flats, aviator shades, and a hat! If you don’t want to go all out hippy and want to look more grown up; wear a couple of flower patches on your sleeves lined with studs on an oversized retro denim jacket. The rest of the outfit should be simple with a black top and ripped skinny jeans. Cover the whole back of your jacket with patches, Rihanna style. You don’t really need anything else, except for cool round sunglasses, a care-free hairstyle, and a smile. And yes, there is a dress ENTIRELY made of patches, and Diane Krueger is looking quite stylish in it, paired with stiletto sandals and a matching yellow clutch! We hope we showed you all the different ways you can style this easy DIY project, without looking like an old school metalhead (not that we have anything against that - if you like it, go for it). General rule is – let your imagination run wild, but keep the rest of the outfit fairly simple to avoid clashes, and to keep the attention where it should be! What’s your opinion? 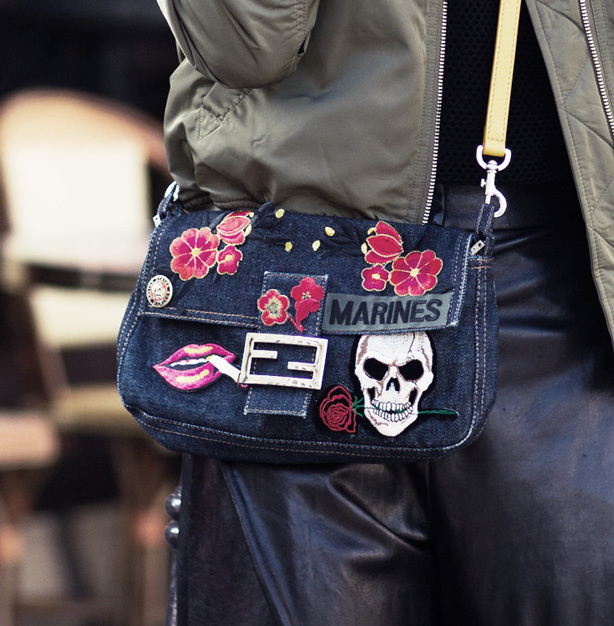 Will you be rocking the patches trend and how? Let us know in the comments!